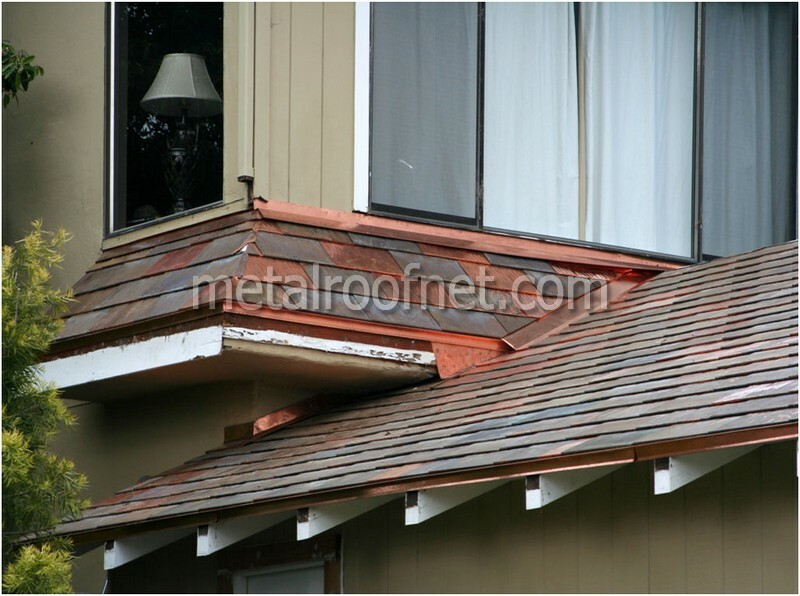 Welcome to the leading source of Information, photos and descriptions about copper roofing in its many beautiful configurations, from copper shingles to copper tiles to copper panels and everything in between. Here's an in-progress shot of a custom blend of hand-patinated and new solid copper shingles. Talk about a custom job! 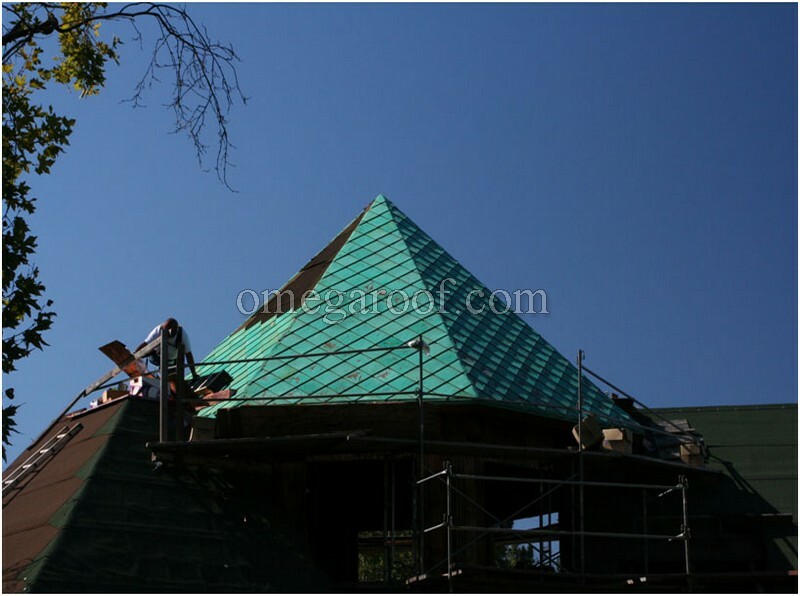 These custom copper shingles make a dramatic statement on this home, and the job isn't even finished yet! Check back soon to see the completed project - we'll post here and on our website too. 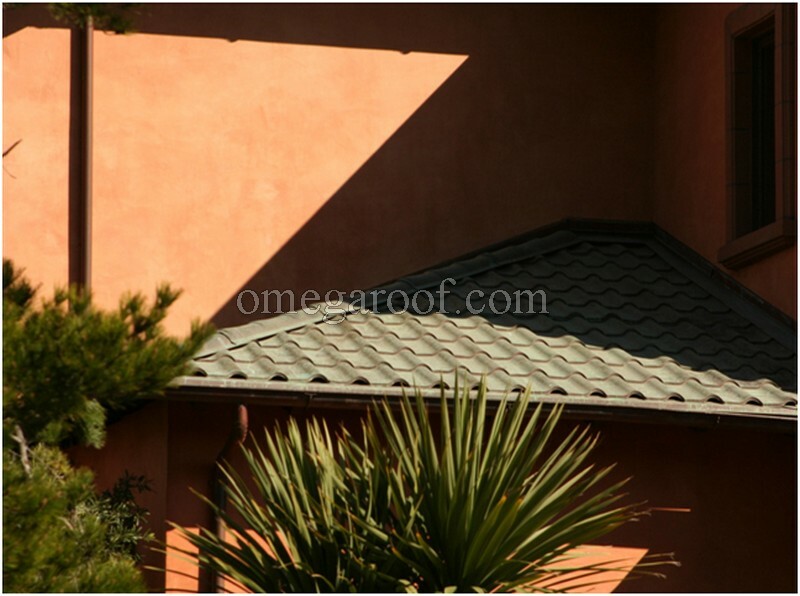 Want to learn more about our custom copper shingles? Here you go! This has to be the owner's favorite job to date, hands-down. 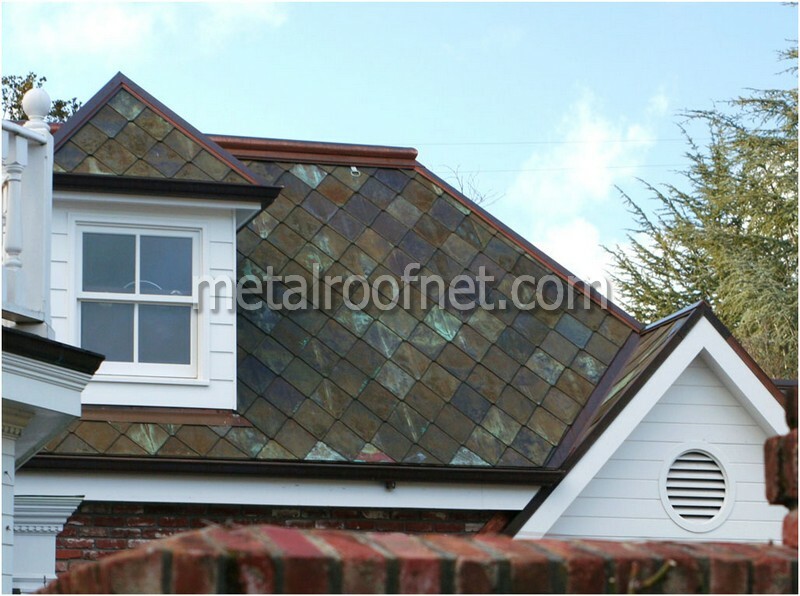 He individually sprayed each copper shingle for a truly custom look. The result is a brand new roof that looks hundreds of years old. Gorgeous! Like this? Check out the profile and more pics here. These are photos of the progress of a very beautiful and unusual project: a copper-roofed turret for a new custom home under construction. 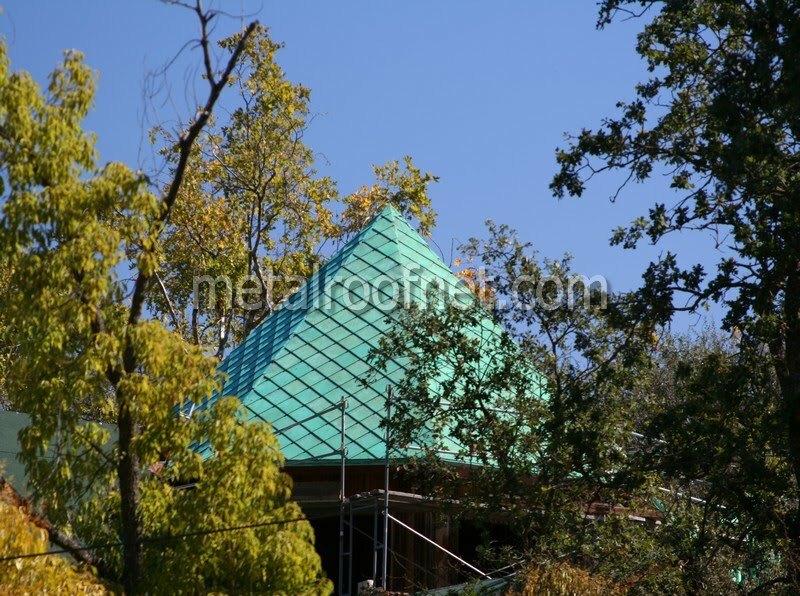 The client wanted something spectacular and unusual to finish off his very distinctive new home, and chose the MRN Patagonia Diamond roof shingle in solid copper. 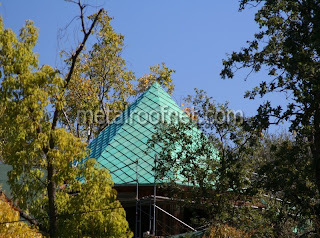 The shingles were then individually treated with a special solution to mimic decades of exposure so they'd display that special "patina" that is unique to old copper roofs. We hope the client finishes his job project soon as we're excited to see and photograph the completed turret roof. Like this profile or material? Get more details here. From our friends at Varozza Winery: "I would highly recommend Chris. He was professional but even more he was helpful and worked to make it work for us and get us exactly what we wanted. He is now part of our winery family and we look forward to working with him again when we do our home. We also look forward to his coming to all our winery events. He was here to help us bottle our 2007 wine and I look forward to opening some of those bottles over the next twenty years and looking at our beautiful roof and having all of our construction finished and the time to enjoy all our friends and family in our beautiful historic winery." Many thanks to the beautiful Varozza winery! 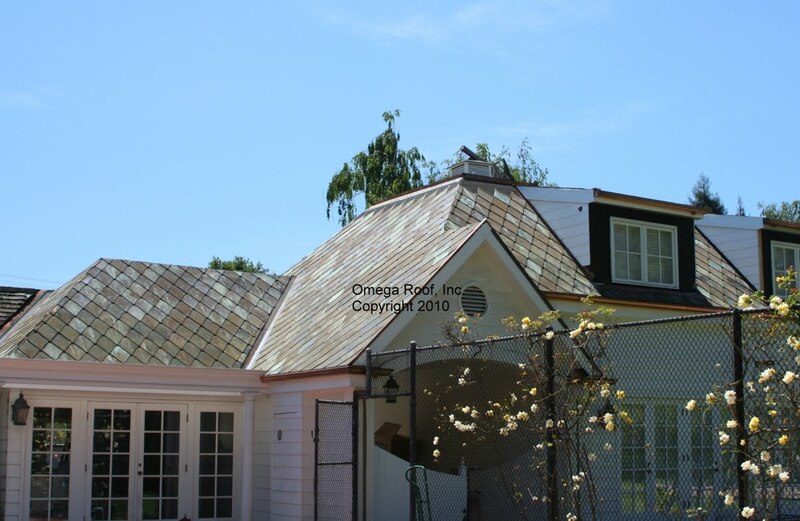 See the beautiful copper shingles we supplied here. This picture of a barn in a vineyard illustrates something that I find rather interesting - the rates at which copper changes in different locations. We were able to get some reclaimed copper shingles from another project for this client, but unfortunately weren't able to get enough to do the entire roof. So, we supplied new, matching shingles of the same size and shape as the old, and that was how the contractor was able to complete the job. What amazes me from viewing the picture (and seeing the finished job) is how well blended the new are with the old. I recall vividly how worried was the client ( and me! ) that the new copper would stick out like a shiny sore thumb for an uncomfortably long time. Now, just a few months after installation, it's not even a concern. 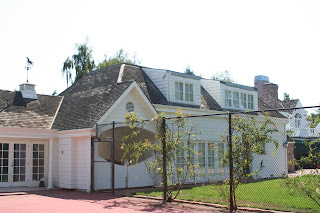 There are enough old shingles on this side of the roof, and even though nearly a third of this entire slope is new (and was VERY shiny and new-looking when first installed), it can barely be detected now. Everyone's happy! I'm sure that in a location that didn't have such a wet winter, or in desert or dry locations it might not have blended as well, but in this case a little patience, and a little effort by the installer to mix some old with some new, made for a beautiful, "aged" copper roof that's as good as new - and good for the next century or more. Like copper roofs? We've got more! Take a look here. Every now and then a project comes along that is so much fun, it's just not like working. This is one of them. 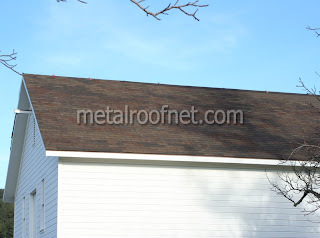 The client needed a new roof to replace their 20-year-old wood shingles and wanted something attractive, permanent, lightweight and eco-friendly. 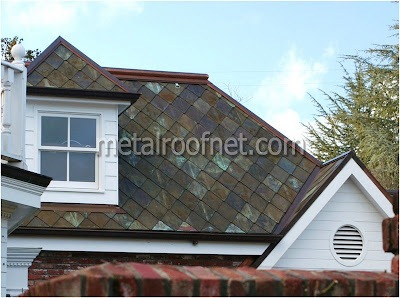 After considering a number of the "fake" slates, shingles and other synthetic lightweight entries, they decided that the pictures in the brochures were much nicer than the materials up close, and they didn't want to install something "artificial" on their English Country Estate style home. Coming across our website they decided to investigate metal, and it wasn't long before I was showing them some of my favorite copper profiles. me a picture with a similar notion and wanted to know if I could emulate a "distressed" copper roof. That one never happened, but here was the perfect opportunity. My excitement grew when this client decided to go with the copper and loved the idea of the mosaic effect of accelerating the "aging" of the copper before they were installed. As he explained to me, the English Country Manor look was famous for a style of home that might be added to as generations moved in and out of the family estate. That the copper might look slightly different from section to section would play perfectly into this feature of the style. And so we've begun. I couldn't be more excited about the progress, and will be adding new pics as each section is completed. For more information about this material, visit our site. Here's a great shot of some copper tile we supplied for a beautiful California home. Interested in other types of metal roofing? 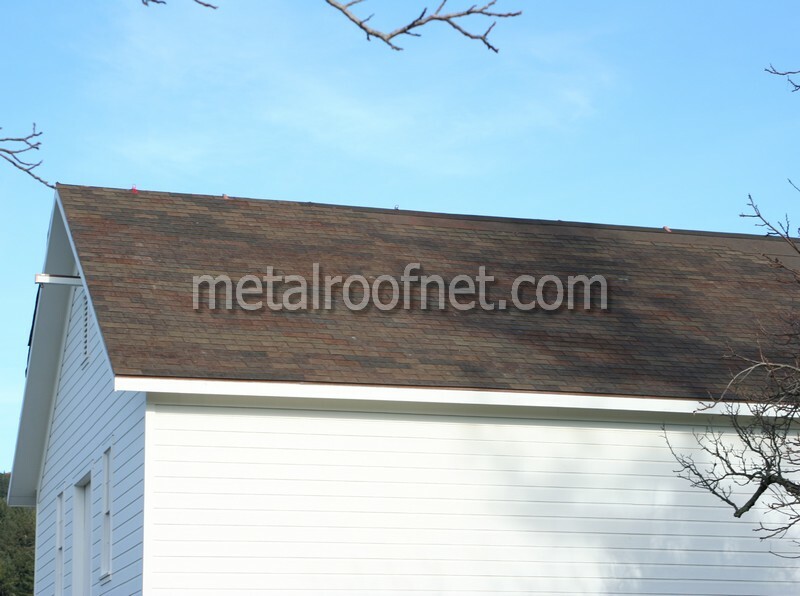 Visit our Metal Roof blog! NO PHOTOGRAPHS MAY BE REPRODUCED WITHOUT PERMISSION. IF YOU'RE INTERESTED, CONTACT US VIA OUR WEBSITE.